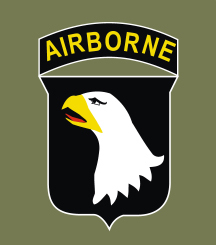 The 2/17th Cav began as airborne infantry with the 101st Airborne at Ft. Campbell in the late 1950's. When the Army began investigating airmobile doctrine and tactics, the 2/17th was given H-34 Choctaw helicopters to train with. In 1967 the 101st Airborne Division began deploying to Vietnam. A Troop went with the first deployment, and B Troop deployed in 1968. The H34s were left behind and the 2/17th became a ground cav unit with APC's. However, the terrain the 2/17th was deployed in did not favor the use of ground vehicles and tracks. In late 1968 the decision was made to convert the 2/17th to an air cav unit. By March 1969 the conversion was complete, with air crews trained and Hueys assigned to all troops. The 2/17th remained an air cav unit in VIetnam until it's stand down in 1972. 1969 - Headquarter Troop, 2nd Squadron Many Headquarters Troop ships wore a small red/white cavalry guidon on the frame, just behind the upper right corner of the pilot's door. Photos show an entire flight line of Headquarters Troop Hueys sporting the guidon. The first two digits of the tail number were painted in black, the last three digits were in white. Several Headquarters Hueys were photographed with windowless front cargo doors. 1969 - A Troop, 2nd Squadron A Troop aircraft carried a red stripe on the tail boom. The first two digits of the tail number were painted in black, the last three digits were in white. Some A Troop ships carried crossed yellow cavalry sabers on the pilot's doors or nose, but this was not universal practice by all crews. 1969 - B Troop, 2nd Squadron B Troop aircraft wore white stripes on the tail boom. At least some B Troop tail numbers were entirely in black. Some B Troop ships had the front edges of their skids painted black. A few B Troop aircraft also wore crossed yellow cavalry sabers, either on the pilot's doors or nose. However, this was only individual preference of the crews. Photos show most B Troop ships without any saber decorations. 1969 - C Troop, 2nd Squadron C Troop ships wore a medium blue stripe on the tail boom. The first two digits of the tail numbers were painted in black, the last three digits in white. 1969-70 - F Troop, 2nd Squadron F Troop, 2nd Squadron/17th Cavalry was organized in December 1969 from Co. A, 101st Aviation Bn. F Troop had 8 UH-1Hs as lift ships, 8 OH6As as aero scouts, and 9 UH-1Cs as gunships. F Troop ships wore orange tail boom stripes. 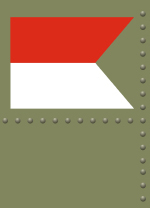 Tail numbers were in black, with a small 101st Division emblem beneath the tail number. Photos show at least one F Troop ship wearing yellow crossed sabers on the pilots' doors. In March 1970 F Troop was disbanded and the unit returned to an assault company of the 101st Avn Bn.